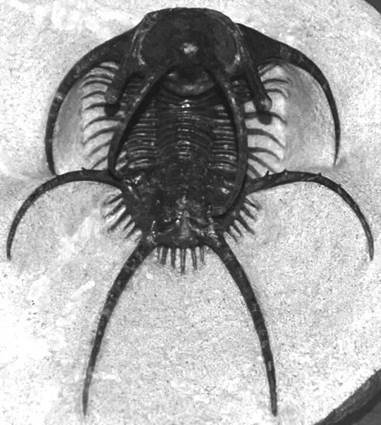 Some polymeroid trilobites evolved extremely spinose bodies, especially odontopleurids and some lichids. 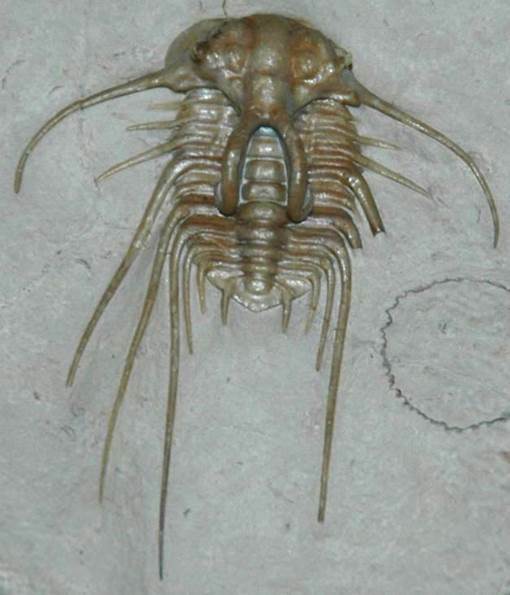 Examples of spinose odontopleurid and spinose lichid trilobites are shown below. Ceratarges spinosus from the AM Limestone (Middle Devonian) in southern Morocco (FMNH PE 60826, Field Museum of Natural History, Chicago, Illinois, USA). 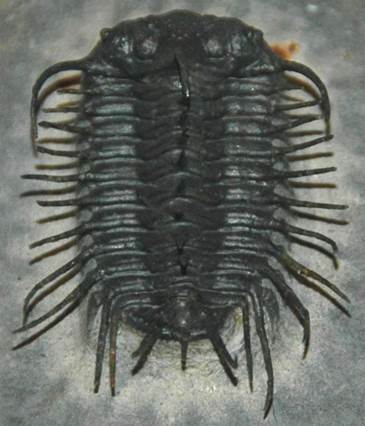 This complete exoskeleton has eight prominent spines. It has two pairs of long, curving cephalic (head) spines - one pair of genal (cheek) spines and one pair extending from the glabella. The eyes are perched atop a pair of stalks that extend posteriorly upward. The pygidium (tail) also has two pairs of long, curving spines - one pair from the anterolateral corners and one pair extending from the posterior pygidial margin, straddling the axis. Series of smaller, straight spines are present between the larger pygidial spine pairs. Dicranurus hamatus elegantus (Campbell, 1977) from the Haragan Formation (lower Lower Devonian) in Coal County, southeastern Oklahoma, USA (FMNH PE 60440, Field Museum of Natural History, Chicago, Illinois, USA). Dicranurus has a pair of thin, long, curvilinear genal spines and a moderately robust pair of strongly curved occipital spines. In lateral view, the occipital spines appear coiled, like a ram's horns. The thorax has a series of pleural spines that trend posteriorly to being longer and more strongly bent backward. The pygidium (tail) is small and has one pair of moderately short spines. Isoprusia tafilaltana Alberti, 1976 (often referred to by its junior synonym Koneprusia brutoni Alberti, 1983) from the lower Hamar Laghdad Formation (middle Lower Devonian) at Tafilalt, southeastern Morocco (FMNH PE 60833, Field Museum of Natural History, Chicago, Illinois, USA).